MidCal MINIs is introducing a new run this year, something short and sweet, not too far from home, but with just enough twisties and mountain scenery to make it a fun run. 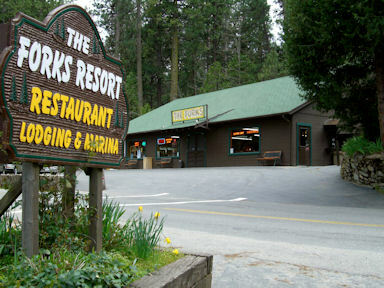 The run will include a stop at the Yosemite Mountain Sugar Pine Railroad and then lunch at The Forks Resort. 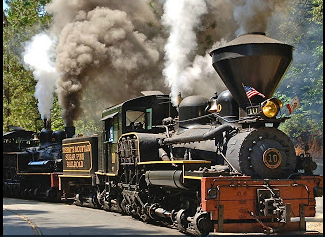 The Yosemite Mountain Sugar Pine Railroad (YMSPRR) is a historic 3 ft (914 mm) narrow gauge railway with two operating steam train locomotives located near Fish Camp, California, in the Sierra National Forest near the southern entrance to Yosemite National Park. Rudy Stauffer organized the YMSPRR in 1961, utilizing historic railroad track, rolling stock and locomotives to construct a tourist line along the historic route of the Madera Sugar Pine Lumber Company. The current railroad follows a portion of grade originally carved into the mountain by the Madera Sugar Pine Lumber Company in the early 20th Century. The company originated in 1874, when it was organized as the California Lumber Company to log the area surrounding Oakhurst, California. The Madera Sugar Pine Lumber Company once had a large sawmill at Sugar Pine, California, just south of the current YMSPRR. The railroad had seven locomotives, over 100 log cars, and 140 miles (230 km) of track in the surrounding mountains. In addition to the railroad, the Company also transported lumber in a flume that stretched 54 miles (87 km) from Sugar Pine to Madera, California. This was the most efficient way to transport rough cut lumber out of the mountains for finishing and transport at the bottom of the mountain. The Madera Sugar Pine Lumber Company practiced clearcutting, which removed almost every single tree within the stands of timber surrounding the YMSPRR track. The thick forest surrounding YMSPRR today belies this history, although large stumps from the original old growth timber dot the forest floor lining the tracks. Due to the onset of the Great Depression and a lack of trees, the operation closed in 1931. But the graded right-of-way through the forest remained, enabling the Stauffer family to reconstruct a portion of the line in 1961. The current railroad utilizes locomotives, converted log disconnect cars, and other railroad equipment purchased from the West Side Lumber Company after it ceased railroad operations in 1961. 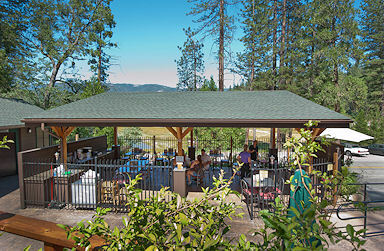 Located on Bass Lake, in the Sierra National Forest, 14 miles from the southern entrance to Yosemite National Park and 8 miles from the southern end of the Golden Chain Highway through California’s Gold Country. The Forks Resort has built a reputation as a traditional family vacation spot. Family owned and operated for three generations, The Forks has provided quality and consistency year after year to their customers. The Forks Restaurant, home of the famous “Forks Burger”, offers the finest in family dining. Breakfast, lunch, and dinner featuring homemade soups, chili and dressings, served in the original “50’s Diner” setting. Leave Starbucks at 41 and Shaw at 9:00 a.m. 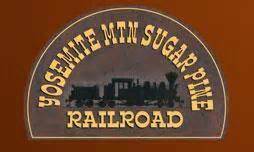 Arrive at Yosemite Mountain Sugar Pine Railroad at approximately 10:45 a.m.
Purchase tickets for the train $19.00 or adults, $9.50 for children (tickets may also be purchased online at Tickets or at the location). The group will board the train and ride from approximately 11:00 a.m. to noon. 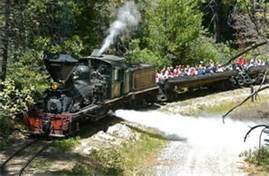 Leave Yosemite Sugar Pine Railroad at approximately 12:30 p.m. driving about 20 minutes to The Forks Resort. The Forks Resort Restaurant menu. 39150 Road 222 Bass Lake, CA 93604 Phone:(559)642-3737 – Please note that this location is a very busy location and it is a first come first serve. Also parking will be difficult but the food is awesome. Have lunch in their outdoor eating area. RSVP to Tina at mcm@midcalminis.org so that an accurate head count may be obtained. Please provide a complete head count by number of individuals attending.